Il Nintendo eShop ha rivelato la data di uscita di Moero Chronicle H, titolo disponibile settimana prossima sui Nintendo Switch giapponesi. Il noto dungeon-crawler RPG sarà disponibile dal 31 gennaio 2019 sull’eShop giapponese di Nintendo Switch al prezzo di 4.000 yen, 2,800 se pre-scaricato prima del lancio ufficiale. Potete trovare informazioni sul titolo di seguito. 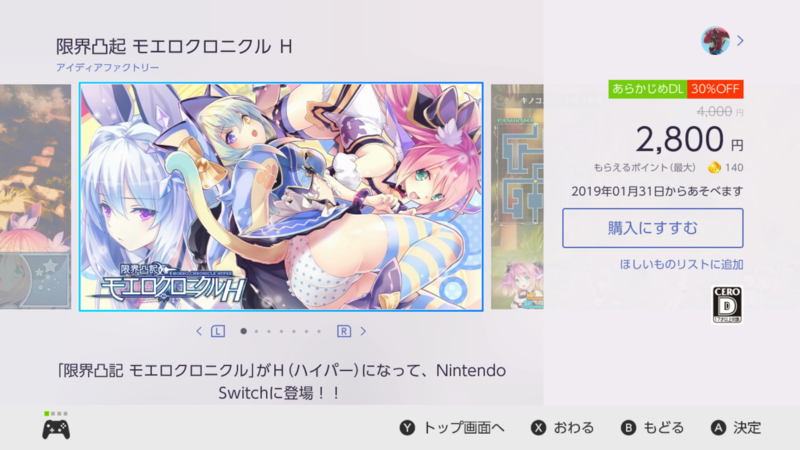 Moero Chronicle Gets H (Hyper) and Debuts on Switch! System-side enhancements like “Auto-Pilot” and “Status Up Items!” With HD image quality and HD rumble support, you can enjoy Monster Girls with even more hype! A world where humans and Monster Girls coexist. When a natural disaster suddenly occurs, the Monster Girls start to act hostile towards the humans. In order to find the cause of this, an ordinary young man named Io sets out on an adventure with Lilia, his childhood friend and a Monster Girl.